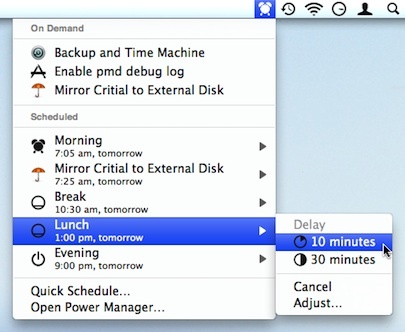 Power Manager lets you alter your energy saving schedule to suit changes in your own schedule. When setting up an energy saving schedule, we recommend creating events that match to your normal daily or weekly routine. However, it would be foolish to assume your routine does not change. We felt it was important to ensure Power Manager could deal with environments where a routine is often not possible to maintain, but where some energy saving could still help. To help in these situations, Power Manager supports the ability to alter the pending events. These are the events due to occur at specific times and dates; such as your computer sleeping for an hour over lunch. If your lunch time changes, you should be able to easily alter your energy saving schedule to match the change. Any changes only affect the next pending event. If you alter the time of today's lunch event, tomorrow's lunch event will remain unchanged. This is a subtle difference but a powerful one. You can freely alter any and all pending events without affecting the underlying base event. If your schedule changes enough that you find yourself altering every pending event, it is time to revisit your energy saving schedule and make some changes to the base events. Power Manager's pending events can be delayed in units of 10 and 30 minutes. You can delay the event as many times as you like. Sometimes you will want to move a pending event to a specific time and date. Power Manager's status menu lets you do this through the "Adjust…" menu item. You can adjust any pending event and tell it to trigger at a specific time and date. You can even tell the event to trigger sooner rather than later. You can cancel a pending event. When you cancel an event, that event will not be triggered. If the event is due to repeat, the next repetition will be scheduled in its place. Consider cancelling a sleep over lunch event; when today's lunch event is cancelled, Power Manager will evaluate the base event again, skip today's cancelled event, and queue up tomorrow's lunch event. If you decide your delays, cancellations, or adjustments are not longer needed, you can reset the event. Resetting the event removes all alterations. This article was posted in Energy saving, Guide, PM4, and Power Manager and tagged dssw, pending events, Power Manager, and schedule.